Hotel, apartment or hostel - look for the best deals on the best sites. Disneyland Paris opened in 1992. Currently, it is one of the most visited amusement parks in Europe. Disneyland Paris visits more than 12 million people per year. It covers an area about 19 square kilometers. 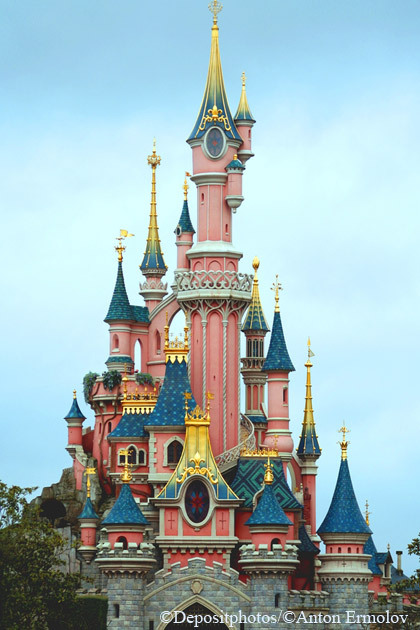 Disneyland Paris is located in the suburb of Paris Marne-la-Vallée, a distance about 32 kilometers to east of Paris. Disneyland Paris includes two theme parks (Disneyland Park and Walt Disney Studios Park), a separate area with shops and cafes Disney Village, a few hotels, and even golf courses. The most famous part of Disneyland Paris is Disneyland Park. It is divided into five parts. In the center is located The Castle of The Beauty Sleeping in the Wood (Le Château de la Belle au Bois Dormant). To the castle leads the street “Main Street USA”. The Disneyland Park also includes: Adventure land, Frontier land, Discovery land, Fantasyland. The photograph shows the Sleeping Beauty Castle. Castle guards dragon! His cave is located under the castle. Walt Disney Studio Park is the second part of Disneyland Paris. Disneyland Paris can be reached by high-speed train RER, line A. The RER stations are available in many places in Paris. The nearest RER “Marne-la-Valle / Chessy” station is located between the Disneyland theme parks and the territory of Disney Village. From Roissy / Charles de Gaulle and Orly airports Disneyland Paris can also be reached by bus VEA. You can see the location of the theme park on a map of Paris.  You can buy tickets to Disneyland and some popular attractions online here. If you come to Paris specifically to visit Disneyland, you can book a hotel next to the amusement park. Close to Disneyland, there are several hotels (Disneyland Hotel, Disney's Hotel New York, Disney's Newport Bay Club, Disney's Hotel Cheyenne, Disney's Hotel Santa Fe). If you've been in Disneyland Paris, post about your experience in the comments at the bottom of the page. Join our Facebook Travel group to follow the news, discuss topics and publish comments. Due to the increased activity of spammers, comments publication is temporarily suspended (for unregistered users). #visitplus #visit_plus. Guides: Paris, Rome, Barcelona, Helsinki, St. Petersburg and other top destinations. Useful online services: the best websites for hotel booking, find flights, railway tickets. Book hotels online around the world. Prepare for travel - online services for travelers.